The mandible's coronoid process (from Greek korone, "like a crown") is a thin, triangular eminence, which is flattened from side to side and varies in shape and size. Its anterior border is convex and is continuous below with the anterior border of the ramus. Its posterior border is concave and forms the anterior boundary of the mandibular notch. Its lateral surface is smooth, and affords insertion to the Temporalis and Masseter. Its medial surface gives insertion to the Temporalis, and presents a ridge which begins near the apex of the process and runs downward and forward to the inner side of the last molar tooth. Between this ridge and the anterior border is a grooved triangular area, the upper part of which gives attachment to the Temporalis, the lower part to some fibers of the Buccinator. Mandible fractures are common injuries. However, coronoid process fractures are very rare. Isolated fractures of the coronoid process caused by direct trauma are rare, as is anatomically protected area complex zygomatic arch-temporo-zygomatic bone and associated muscles. Etiology, most fractures are caused by strokes (contusion or penetrating injuries). Position of coronoid process in skull (shown in red). Animation. 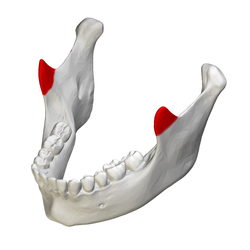 Position of coronoid process in mandible (shown in red). Animation. The Temporalis; the zygomatic arch and Masseter have been removed. Anatomy photo:22:os-1006 at the SUNY Downstate Medical Center - "Osteology of the Skull: Mandible of Intact Skull"
"Anatomy diagram: 34256.000-2". Roche Lexicon - illustrated navigator. Elsevier. Archived from the original on 2014-01-01.